For me nothing beats using a real amp when playing live. But for recording, software amp simulators are great. You can’t beat the convenience and affordability of having numerous amps available in software. I have been using software amp simulators for many years for recording. I have IK Multimedia’s AmpliTube 3, AmpliTube Jimi Hendrix, AmpliTube Fender, and AmpliTube Orange. I also have Native Instruments Guitar Rig, Garage Band, and MOTU Digital Performer which includes amp sims. So when I got an iPad Mini I was eager to test out AmpliTube for iPad. The reality is, an iPad simply doesn’t have the computing power of a modern laptop or desktop Mac, so AmpliTube for iPad is better suited as a practice, songwriting, or idea tool then a full fledged DAW. A few years from now that may change, but if you are expecting a current mobile device to replace a laptop for music production you will likely be disappointed. However, if your expectations are realistic you may find that iPads make great guitar companions for lighter duty tasks. AmpliTube for iPad has an interface similar to AmpliTube 3 but more streamlined. The screen has room for an amp head and four effects pedals. Which is the limit of what you can use at one time. A small row of buttons on the bottom let you access everything else. The interface works quite well with a touchscreen. You “rotate” amp and effects knobs by touching them and then using an up and down motion. It works fine. 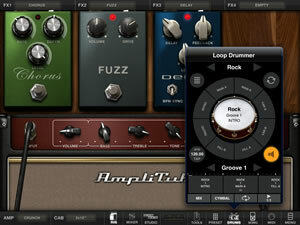 AmpliTube for iPad comes with models of five amps, five cabs, eleven effects and two microphones for $19.99. Basically you get a Fender model (clean), a Vox model (crunch), a Marshall model (Lead), a Mesa Engineering model (Metal), and a bass amp. Effects models include a variety of drive, modulation and delays. You also get one channel of an eight track track recorder, one drum kit (rock) and groove set, nine rig presets, a tuner, and a song learning tool with variable speed, looping, and voice limiting. I dislike in-app purchase as much as the next guy but they don’t seem to going away anytime soon. While they do make the cost of entry low or even free, and allow you to buy only what you want, if you buy the recording bundle, some drum style kits, and a few of the amps or amp bundles, it can add up to significant money. By comparison with Apple’s Garage Band for iPad you get eight amp and ten effects models, tons of loop content, keyboard instruments, drum instruments, and multi-track recording for free. Of course Apple can afford to give apps away since it sells the hardware that runs the apps. IK Multimedia needs to make money on its software to stay in business. Most people will be using an iPad with some type of earbuds or headphones when making music. I used high-quality Klipsch earbuds and Sony Headphones for monitoring. Obviously inexpensive earbuds will not sound as good. If you can hook your iPad up to high-quality external speakers it should sound even better. The included amps and effects sounded good, but cabs make a huge difference in tone. Most amps sounded thin or even harsh with the 1 X12” cab, but vastly better with any other cab. Perhaps IK modeled a cheap 1 X 12 cabinet. For a mobile device the models are quite good and cover a basic variety of tones, but many popular amp models require in-app purchases. The song learning tool is a nice feature for practicing. It allows you to minimize vocals and slow down music for easier learning once you have imported and converted songs from your library. This makes AmpliTube for iPad a nice practice tool for those learning songs. Since the included recording capabilty is only one track with no editing, I purchased the recording bundle to see how much recording I could actually accomplish with an iPad Mini. The recording bundle gives you eight tracks for recording using a reel to reel tape recorder interface. It also include a DAW style interface for editing recordings. The amount of editing you can do is obviously limited by the touch screen interface, but you can do basic editing like trimming and splitting audio, moving audio from track to track, and copy and pasting. It is basic but good enough for putting down ideas and making demos. I made a short eight track demo which I exported and made into a movie. You can play it below to get an idea of what you can reasonably accomplish with the Recording bundle upgrade. With eight tracks and very few effects my iPad Mini had reached the limit of its power. If you use a lot of effects on your amps you will probably not be able to get 8 tracks without the iPad choking. Although the recording tool works well and can be good for getting song ideas down, it won’t be replacing my laptop for recording anytime soon. I actually prefer AmpliTube for iPad for just plugging in, starting the Music app, putting it on random and soloing to whatever song comes on. It is also great for practicing on the go. 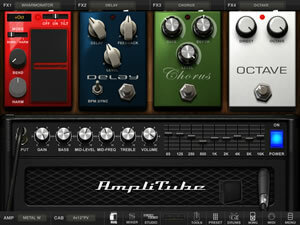 AmpliTube for iPad offers a basic set of good sounding amp and effects models, and a nice song learning tool. It can turn your iPad into a handy practicing and idea capture device. However, many useful items and popular amp models require in-app purchases. You can make it into a multi-track recording tool and stock it with many different amps and effects models but it will cost you considerable money to do so. Although you can spread the cost out over time. There is a FREE version of AmpliTube for iPad that only includes the Marshall model and three effects. If you have specific amps in mind it may be a better way to get started, allowing you spend the same $20 on amp or effects models you really want.